Here’s an easy soup that’s simple, fast and delicious! It is light yet will warm your soul on a cold winter day. It’s made with the super-veggie kale, along with potatoes, carrots, and leeks. Beans were added for protein and fiber. It’s simple and well worth trying! A video is below showing how to make the soup. The written recipe is below that. Enjoy! Heat the olive oil in a large pot with a lid, over medium heat. Add the leeks (or onions), garlic, carrots, and sliced kale stems. Sauté the vegetables for 3 or 4 minutes, until they are aromatic and starting to soften. Add the potatoes, kale leaves, beans, broth, water, parsley and thyme. Stir to combine. Bring the soup to a boil, cover with lid, and lower heat to simmer. After the soup has cooked about 10 minutes, taste for seasonings and add salt and pepper to taste. Allow soup to simmer, up to 30 minutes, to allow vegetables to soften and flavors to blend. Enjoy! 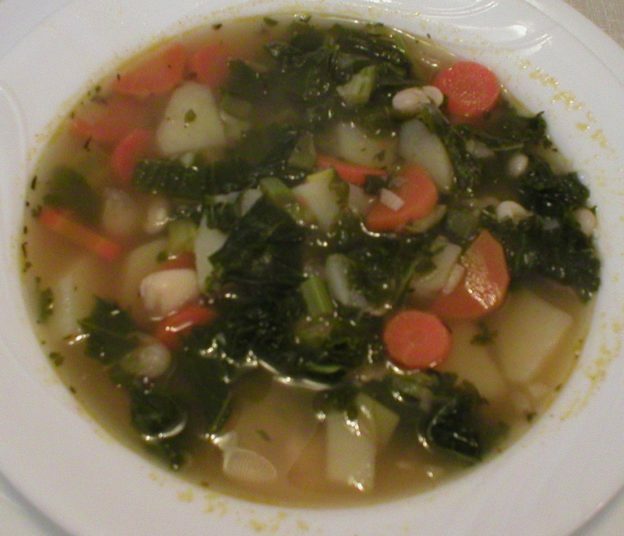 This entry was posted in Food and tagged easy fast soup vegan, kale soup, vegan kale soup, vegetarian soup recipes on February 6, 2019 by Judi.